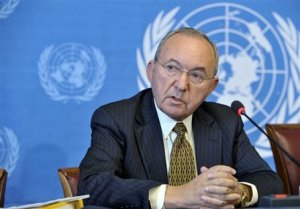 Judge Richard Goldstone, a South African Jew, who had previously served as the chief UN prosecutor in both Yugoslavia and Rwanda, presents his UN sponsored Report on the Fact-Finding Mission on the Gaza Conflict. The report was highly critical of both Israel and Hamas in their respective actions during their confrontation the previous December/January. Supporters of Israel took particular offense at the Report’s findings and methodology. On April 1, 2011, in an OPED in the Washington Post, Goldstone recanted portions of the report that suggested Israel intentionally inflicted deaths on civilians. He did not totally exonerate Israel, but realized his investigation methods were flawed and incomplete.